David Lynch's deep love for music is a meanwhile well-known fact. He is listening to music while he thinks about writing and on the set to check if something works or not. He is also regularly playing music on his sets to create a certain mood for a scene, to help the actors or the D.P. to get into that mood. Lynch opened up his own sound and recording studio in 1998 to continue pursuing his musical interests. A first album Lux Vivens has been released in August 1998. While Lynch was filming the Death Row sequences for Lost Highway in a abandoned fire station building in LA, he was blasting the "Herzeleid" album by the German "dance-metal" band Rammstein at full power through two huge loudspeakers he had placed on the set. Moreover, he didn't just play it while he was shooting but also during the pauses  and, the Lost Highway crew must have been totally crazy about it. Henry Rollins (who plays Prison Guard Henry) reported that the crew started to dance ecstatically to Rammsteins earsplitting sound. Eventually Asymmetrical (Lynch's Prduction Company) had to order more than 70 "Herzeleid" CDs from Motor Records (Germany) for the crew. 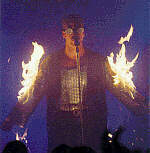 So how did Lynch get in touch with the German band Rammstein anyway? Lynch mentioned in an interview with the French movie magazine "Positif" that Rammstein used to send him their CDs but he didn't ever listen to it. One fine day  he was scouting for filming locations in Death Valley  he somehow happened to put the Rammstein album in his car stereo. This music was exactly what he was looking for and so two Rammstein songs ended up on the Lost Highway soundtrack. 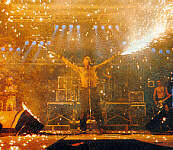 Rammstein released in summer 1997 their second album "Sehnsucht". The two songs from the "Lost Highway" soundtrack can be found on their debut "Herzeleid" in full length versions.